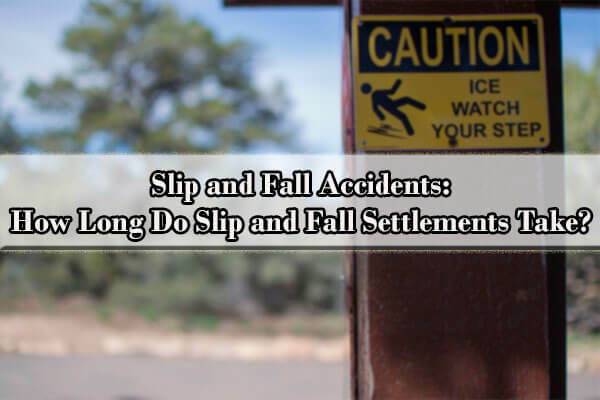 How long do slip and fall settlements take? In New York slip and fall accidents are one of the most frequent personal injury accidents that occur. They take place everywhere and all the time. Sometimes they take place in other peoples’ homes, while you’re inside the store, on the sidewalk on your way to the post office, outside the parking lot while you’re walking into the store, and just about anywhere. What to Do After Slip and Fall Accident ? Bonus: What to Do If You Slip and Fall at Work? What Can a Slip and Fall Attorney Do for Me? A slip and fall accident , or what’s sometimes called a personal injury (PI), can cause tremendous stress to yourself and loved ones. Not only do you have to deal with the physical injury itself and the medical bills, but you may sustain lost income, some type of disability, and you may not know the first thing on what to do. With such issues to consider, you may be asking yourself how long does a slip and fall case take in NY? Each slip and fall case is different and each individual who sustains a slip and fall accident has their own unique set of facts. However, there are two chief factors in determining how long a slip and fall settlement may take. The first factor is liability. Just because you slip and fall on somebody else’s property, does not automatically mean that the property owner is liable. There needs to be some sort of legal negligence involved, meaning that the property owner must have either done something wrong or failed to do something right which contributed to your accident. For instance, one of the most common slip and fall injuries occurs when somebody slips on some slippery substance. As the injured party, in order to prove negligence, you have to prove that the owner knew or should have known about the slippery substance in order to prove liability, and that the slippery substance is a dangerous enough condition to have approximately caused your accident. Although this might sound simple enough to prove, it isn’t. For instance, what happens if another customer spills soda on the store floor and five minutes later, you fall and slip on it and get injured? Under this scenario, the owner of the store might not be as liable because they didn’t have proper notice to be able to clean the spill. This is in contrast to another scenario in which another customer spills soda on the store floor, and it stays on the floor for about an hour, and no store employee bothers to clean up the substance. In this scenario, the owner is definitely a lot more liable because they had more time and notice to clean up the soda. The second factor is damages, which means how injured you are. Damages are composed of medical treatment, lost wages, and permanent disability. Generally, the more medical treatment you’ve received and the higher your bills are, theoretically, the more damages you’ve sustained. Again, both liability and damages are essential in how long a slip and fall accident will take. What to do if you slip and fall at work? If you slip and fall at work, or if you have any type of injury at work for that matter, then instead of having a liability accident, you have a potential workers’ compensation claim. In a workers compensation claim, again, proving damages and liability are key to determine how long a slip and fall accident at work case will last. What to Do After Slip and Fall Accident? Like any legal case, the best way to secure the highest settlement possible is by having the evidence. Accordingly, the more you document the slip and fall accident, the better your case will be. The first thing you’ll want to do is fill out a slip and fall incident report, if you’re able. This is especially essential if the slip and fall occurred in a store setting. By filling out an incident report, you are officially reporting the injury to the store. The store will then turn the incident report into their insurance company, which which serves as notice to the insurance company of your slip and fall injury. The second thing you’ll want to do immediately is take slip and fall pictures. By documenting where and how you fell, you help establish liability against the property owner. You may also want to take pictures of witnesses and get their contact information. Not only will this make it easier for you when you try to put together your witness list, but will help you prove liability. The third thing you’ll want to do is sue for the slip and fall injury. In order to do so, it’s best to contact an experienced slip and fall attorney to best evaluate your case and what your chances are of successfully being able to receive compensation for your injury. 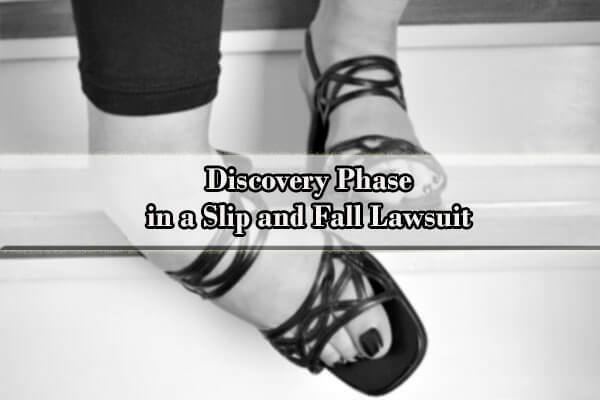 The following is a brief overview of the slip and fall lawsuit process . After you are done treating for your injuries and have reached maximum medical improvement, or MMI, the first step is to send a slip and fall complaint letter or “Demand” letter of what you’re asking for. This letter will document the theory of liability against the defendant, and will also discuss your damages that you are seeking. The insurance company will then respond to your letter. If negotiations fail and you are unable to reach an amicable settlement, then the next step is proceed with a slip and fall complaint and file suit in court. Although you can, technically, obtain a sample slip and fall complaint on the internet and try to handle the case yourself, this is not wise and is definitely not recommended. Drafting a well crafted complaint can be difficult. One missing word or paragraph may affect your entire case and the entire case could be thrown out on a defendant’s motion to dismiss. Accordingly, you should contact an experienced personal injury attorney right away and especially if you plan on filing suit in court. Once the complaint is filed, the Defendant has to answer the slip and fall complaint within 20 days from receipt of the complaint. This is in the form of a written response. If there is an issue regarding slip and fall liability or slip and fall negligence, the Defendant will indicate as such in their answer. Prior to filing suit or, at the very least, immediately after filing suit, you, as the Plaintiff, will want to submit a slip and fall demand letter to the defendant’s insurance company. What this consists of is a demand letter for injury claiming that you are injured, that it is the defendant’s fault, and what are you seeking or “demanding” as compensation for your damages. Again, the demand letter will address a description of how the accident occurred, the theory of liability against the defendant, and then the damages you are seeking for your pain and suffering. Damages consists of medical treatment, medical bills, lost wages, and permanent disability, so the more evidence you can provide of these factors, the higher your settlement theoretically will be. Once the suit is filed in court and the Defendant has answered your complaint, the next step of the litigation process is what’s called discovery. Discovery is a pre-trial procedure in a lawsuit in which each party, through the law of civil procedure, can obtain evidence from the other party or parties by means of discovery devices such as a request for answers to interrogatories, request for production of documents, request for admissions and depositions. Discovery can be obtained from non-parties using subpoenas. In New York, the discovery process includes slip and fall interrogatories. Interrogatories are written questions that one side asks the other in order to learn more about the other side’s case, position, and potential strengths and weaknesses. As such, there are slip and fall interrogatories to plaintiff and there are slip and fall interrogatories to defendant. Both plaintiff and defendant then have to answer each others interrogatories. Some examples of interrogatory questions may include whether the victim had been on any medication within 24 hours prior to the accident, whether the victim wears glasses and what their vision is, or how often do store employees survey the store and look for potential hazards, such as water on the floor. Interrogatories may also include financial and medical information, which may not be easily accessible, which will therefore affect the average time for slip and fall case . These answers to the interrogatories will then lead to an examination before trial (EBT), or more commonly known as a deposition.. At an examination before trial parties will provide sworn testimony in the form of questions and answers that is given before a court reporter. The purpose of the examination is for the other party to discover the details of the claim being made. As discussed above, after the written interrogatories have been completed, the next most common step is to do the slip and fall deposition by deposing a slip and fall plaintiffs. During the deposition discovery phase, the defendant gets to ask the plaintiff any question they want, which is usually based upon the interrogatories that the plaintiff had answered. Should the case go to trial and the plaintiff’s testimony is different from the testimony provided during the discovery deposition, the defendant may then impeach the plaintiff and show that they are not credible or that their testimony is inconsistent. Likewise, the Plaintiff can do the same thing and impeach the Defendant if their testimony is different too. Since depositions are so important in that they go toward impeachment, it is important that you speak with an experienced personal injury attorney prior to your deposition. Before your deposition, your attorney can review typical deposition questions for slip and fall accidents and provide you with a personal slip and fall deposition outline so you’ll know what kinds of questions the defense attorney will be zeroing in on. After the depositions, you may be asking, “How long after a deposition does the case settle?” Again, each case is different, but the next steps usually involve more negotiations and then pretrial motions. The defendant will sometimes file a motion to dismiss your slip and fall case or file a motion for summary judgment. Both of these motions involve the theory that assuming the facts are true, Plaintiff’s legal theory of the case holds no water and therefore the Defendant should win. These pretrial motions often involve very carefully crafted legal arguments and so the experience of an effective slip and fall attorney will be required. Another step in the slip and fall settlement process is mediation. Mediation is a procedure in which the parties discuss their disputes with the assistance of a trained impartial third person(s) who assists them in reaching a settlement During mediation, both sides will be in separate rooms, and an independent mediator will try to work with both defendant and plaintiff to try to come up with a mutual compromise. Mediation is often used as a last resort in the slip and fall settlement timeline. In discussing the timeline, you may be asking how much is my slip and fall case worth? How much can you get in a slip and fall accident? Again, since every case is different, it is difficult to state with accuracy the average slip and fall settlement and exactly how much you will receive. The factors to consider are your damages and liability. The better your damages and liability, the higher your settlement should be. Once you file your slip and fall lawsuit, the next step in the slip and fall settlement process is that the insurance company will automatically hire a defense attorney to defend their position and file an answer to your complaint. The job of the defense attorney is defending slip and fall cases. To do so, they will argue against your liability and your damages by coming up with a number of arguments. They may argue, for example, that the treatment you received didn’t come from the slip and fall, but that it was pre-existing in nature. Or they may argue against liability and argue what’s commonly referred to as the “open and obvious” defense in that the slip and fall that you experienced could have been avoided because it was so open and obvious. In most slip and fall accidents, a settlement is reached between the parties. Accordingly, the percentage of personal injury cases that go to trial is less common, but it is a possibility that you should prepare for. Once the case is tried, the jury or judge will make a decision regarding any damages you may be awarded. If you are denied compensation, in New York, you have 30 days to appeal. If you are appealing your suit, you’ll want to talk with an experienced personal injury attorney. In deciding who to hire, you’ll want to examine how many personal injury judgments they’ve won, how many slip and fall cases they won, and how much compensation for slip and fall injuries they’ve received for their clients. On the reverse, if the judge or jury does award you compensation, depending upon who the defendant is, you may have to go to court just to collect on the judgment. If, for instance, you receive compensation, but the defendant has no insurance, then you may have to take the defendant back to court to be able to collect on the judgment. You do this by going through discovery to find out what assets they have and possibly garnishing their wages. Again, you should consult with an experienced personal injury attorney if you find yourself in this situation. Bonus – What to Do If You Slip and Fall at Work ? If you slip and fall at work, can you sue? Can I claim for an accident at work? Unlike a liability slip and fall accident, in which you have to prove that the property owner of where you fell is legally liable, if you slip and fall at work, you would then be eligible for workers compensation benefits under NY workers compensation laws, and you would also not have to show that your slip and fall was your employer’s fault. By hurting yourself at work, irregardless of your employer’s negligence, you would be entitled to workers compensation. In these types of cases, you’ll want to talk with an attorney for slip and fall cases that specializes in workers’ compensation. Q: How long do slip and fall settlements take? A: Each slip and fall accident has its own unique set of facts and circumstances. Every injury is different and every victim’s treatment and pain and suffering is different. Accordingly, the factors that affect how long a settlement can take are proving liability and damages. The greater your liability and damages, the quicker your settlement will be because the easier it will be to prove your case. Q: How long after a slip and fall can you sue ? A: In New York, the statute of limitation, or the period of time you have to file suit, is three years from the slip and fall date. However, if your defendant is a government entity, then the statute of limitations is one year and 90 days, and in which you have 90 days from the accident date to provide the government with a notice of claim. Q: How to file a slip and fall case ? A: How to file slip and fall lawsuit? After you’ve been injured, you’ll want to immediately fill out a slip and fall incident report, take pictures of your slip and fall, and then go seek medical treatment. Once you’re done treating, you’ll want to submit a demand letter to the insurance company. If you are unable to settle, you’ll want to file suit in court. Obviously, you’ll want to do this under the direction of a experienced slip and fall attorney. Q: Do most slip and fall cases settle out of court? A: Yes, most slip and fall cases settle outside of court. If your damages and liability are sufficient enough, then the chances of the insurance company wanting to settle with you are greater. Q: What is the average settlement for slip and fall? A: Since every accident is different, it’s difficult to say that there is an average settlement. Again, the higher your damages and greater evidence or facts showing your theory of liability, the better the settlement will be. Q: Do you have to pay your medical bills from a personal injury settlement? A: Yes, in general, your medical bills are taken out of your slip and fall settlement. You always have the option of not paying your medical bills or just paying the medical providers a portion of the bills, but it is up to you of how you spend your settlement. However, if a medical lien is on file, then you have no choice but to address the lien. A medical lien is a legal right asserting that before any money is dispersed, that lien first needs to be addressed. Q: How long does it take to get a settlement from a lawsuit? A: How long do slip and fall settlements take? Getting a settlement form a lawsuit and how long it takes is dependent upon how good your liability is that you can prove and how good your damages are. The greater the liability and damages, the sooner you can get a settlement. Q: How many slip and fall cases go to trial? A: The majority of slip and fall cases do not go to trial and end up settling. Going to trial is expensive and time consuming, for both sides, and trial is often seen as a last resort. Experienced slip and fall lawyers understand the slip and fall accident settlement process, the law and approximate what your case may be worth. With this information, they are able to defend, negotiate, speed up, and help obtain a good slip and fall accident settlement. When it comes to choosing personal injury attorneys, you need to discuss your case with a competent and experienced slip and fall attorney to discuss how to best pursue your accident. 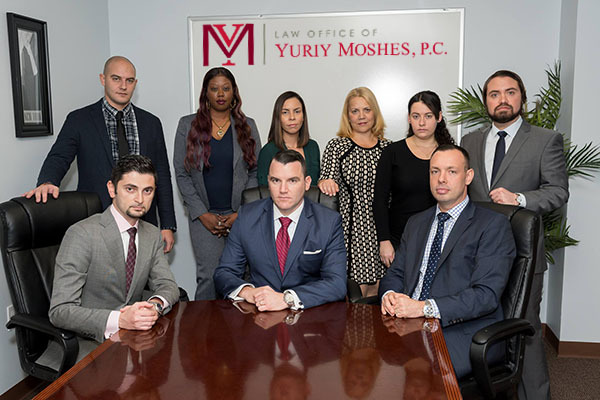 A qualified slip and fall accident attorney from the Law Office of Yuriy Moshes will have the expertise, knowledge, and experience to do this. Moreover, they offer a free consultation. They help victims in the New York City area including all its boroughs (Manhattan, Brooklyn, Queens, the Bronx and Staten Island) as well as Northern New Jersey, Long Island, and Upstate New York.